Batman begins with this film cell presentation! Framed limited edition from the first movie in the Batman trilogy. Features real film from the movie, a numbered name plaque, and a certificate of authenticity! Gotham City's underworld has a new reason to be afraid of the dark. 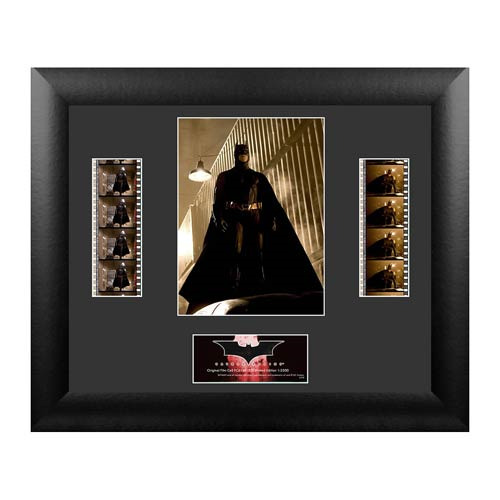 Take home a piece of the first movie in the Batman trilogy with this Batman Begins Series 3 Double Film Cell. Measuring 13-inches wide x 11-inches tall in a black frame, it's a true collectible that boasts 2 strips of real film from the movie, a numbered limited edition name plaque, and a Trend Setters embossed/foiled certificate of authenticity. Limited edition of 2,500 pieces. Made in the USA. Ages 14 and up!